The first ‘real’ military transport plane was the German Messerschmitt Me 323, created in 1942. The basis for its construction was the large Me 321 glider. 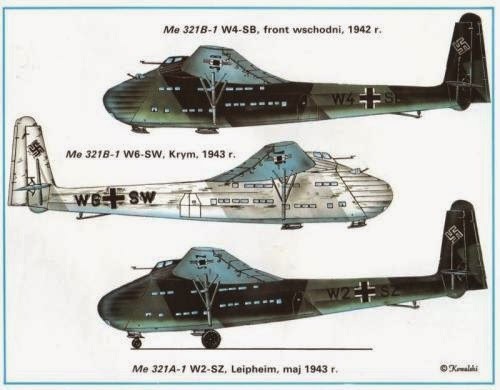 The Me 323, which acquired the nickname ‘Giant’ [German-Gigant] because of its imposing size, had a maximum cargo capacity of 9750 kg, and could carry up to 120 fully-armed soldiers. It was mass-produced until 1944 (198 powered production aircraft were made), and was actively used at both the Eastern and Western fronts. The Me 323 was the biggest land-based cargo transports of the war with loads brought through 11-ft high doors in the front of the fuselage. A total of 213 (including prototypes and conversions) are recorded as having been made, a few were converted from the Me 321. 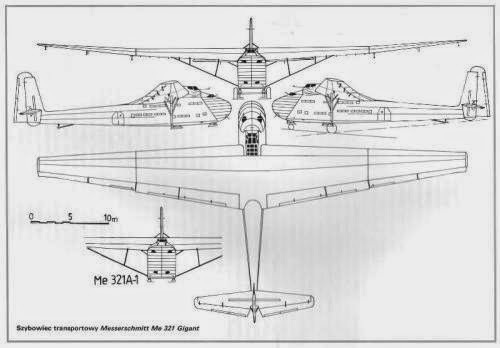 The genesis of the Me 323 Gigant (giant) transport was in a 1940 German requirement for a large assault glider. The DFS 230 light glider had already proven its worth in the famous attack on Fort Eben-Emael in Belgium (the first ever assault by gliderborne troops), and would later be used successfully in the Crete invasion in 1941. However, the prospective invasion of Great Britain focused minds on the need to be able to airlift vehicles and other heavy equipment as part of an initial assault wave. Although Operation Sealion was cancelled, the requirement was still a valid one with the focus now on the forthcoming invasion of the USSR. On 18 October 1940, Junkers and Messerschmitt were given just 14 days to submit a proposal for a large transport glider. The emphasis was still very much on the assault role: the ambitious requirement was to be able to carry either an 88mm gun and half-track tractor, or a PzKpfw IV medium tank. 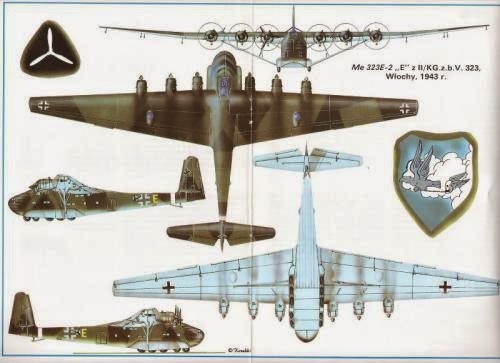 The Junkers Ju 322 ‘Mammut’ reached prototype form, but was completely unsatisfactory and was scrapped. The Messerschmitt was originally designated the Me 261w, was then changed to Me 263, eventually becoming the Me 321. Although the Me 321 saw considerable service, it was never used for a Maltese invasion, or for any other such undertakings. Early in 1941, the decision had been taken to produce a motorized variant of the Me 321. It was now realized that a serious heavy-lift requirement would exist outside the specialized assault role, and that a huge glider that needed specialized towing aircraft, rocket packs and other equipment was simply not the answer. After much study and testing with a converted Me 321 with four engines, it was decided to fit six French Gnome-Rhone GR14N engines. These were in production and readily available, and could easily be bolted on the wing, which consequently needed to be strengthened. A cabin for a flight engineer was added in each wing between the inboard and center engines, although the pilot could override each engineer’s decision on engine and propeller control. A brand-new permanent landing gear was bolted on to the side of each fuselage with eight wheels rather than four, the central gravity on a proper loaded aircraft was on the rear wheel-pair, the modification gave the Me 323 superb rough-field performance. Compared to the Me 321, the Me 323 had a much-reduced payload of between 10–12 tonnes, which was the price that had to be paid for an aircraft that could operate autonomously. Even with the engines, rocket assisted take off packs were still frequently used. Some Me-321s were converted to Me-323s, but the majority were built as six-engined aircraft from the beginning; early models were fitted with wooden two-blade propellers which later was replaced by metal three-blade versions. It was, for its time, a remarkable aircraft. The aircraft was designed with massive, semi-cantilever, high-mounted wings in order to lift the heavy weights desired. As the aircraft technology was not yet sufficiently advanced for this type of wing, they had to be braced from the fuselage out to the middle of the wing. To reduce weight and to save on aluminum much of the wing was made of plywood and fabric. The fuselage was of composite metal-wood-fabric with heavy bracing in the floor to hold the weight. In order to get the powered version of the glider airborne it was equipped with six Gnome-Rhone engines. The French engines were chosen as their design was complete and they could be built in occupied France without interfering with German engine production. Just as on the similar engines used on the Henschel Hs 129 ground attack aircraft, the six Gnome-Rhone engines used on the Gigant had opposing rotation-a trio of clockwise rotation engines were mounted on the port wing, and a trio of counterclockwise rotation engines on the starboard wing. The landing gear where a set of 10 semi-recessed wheels designed to flex like caterpillar treads for landing on rough terrain and to distribute the weight over a large area, a proper loaded Me-323 should have the central gravity on the rear pair of wheels of the five pairs. In all, it bore a remarkable resemblance to the heavy-airlift aircraft of today, indeed, it was the forerunner of this type of transport aircraft. The cargo hold was 36 feet long, 10 feet wide and 11 feet high. The typical loads it carried were: two four-ton trucks, or 8,700 loaves of bread, or an 88 mm Flak gun, its equipment, ammunition and crew, or 52 drums of fuel (45 gal/252 L), or 130 men, or 60 stretchers. The Me-323 transport had a crew of five consisting of two pilots, two flight engineers and a radio operator. Two additional gunners could be carried as well. The pilot’s area was in front of the leading edge of the wing at the top of the cargo area and was armored. It was powered by six Gnome-Rhone 14N 48/49 14 cylinder radial, air-cooled engines each rated at 990 hp. Four rockets could be mounted on each wing outside of the last engine to assist with takeoffs. The left and right side engines had to be counter-rotating to avoid the severe torque that would be generated by six engines rotating in the same direction. It had a maximum speed of only 136 mph (218 km/h) at sea level and speed dropped with altitude. Range was sufficient to transport troops in North Africa flying from Italy. For defensive armament, the Me 323 was armed with five 13 mm machine guns firing from a dorsal position behind the wings and from the fuselage. They were manned by the extra gunners, radio operator and engineers. To make the Me 323 fit for cheap mass production with use of none aviation industry, wood was used and a German furniture company made lot of parts to the fuselage parts in wood, it had been designed with a fabric-covered steel tube framing instead of a conventional light-alloy monocoque structure. Initially, the Me 323 was going to be fitted with four engines, but prototype flight testing showed that six engines were necessary to achieve the desired load-carrying capability. The French Gnôme-Rhône engines used had been designed by Gabriel Voisin. Capable of carrying 100 combat-equipped troops or a similar freight load of about 15 tons, the Me 323 was used in 1943 to ferry supplies and reserve troops from Italy and Sicily to the German Afrika Korps in Tunis and the area of North Africa. However, from Ultra intelligence, the transport formations’ flight schedules were known to the Allies who used this information to send fighter squadron to ambush the aerial convoys and shoot down the transports. A total of 213 Me 323s were built before production ceased in April 1944. There were several production versions, beginning with the D-1. 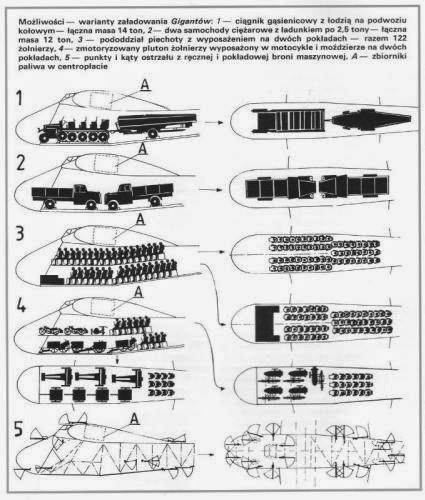 Later D- and E- versions differed in the choice of power plant and in defensive armament, with improvements in structural strength, total cargo load and fuel capacity also being implemented. Nonetheless, the Me 323 remained significantly underpowered. There was a proposal to install six BMW 801 radials, but this never came to pass. The Me 323 was also a short-range aircraft, with a typical range (loaded) of 1,000–1,200 km. Despite this, the limited numbers of Me 323s in service were an invaluable asset to the Germans, and saw intensive use. In the final weeks of the North African campaign in April/May 1943, 43 Gigants were lost, along with much greater numbers of Ju 52s. A demonstration of its frailty occurred on 22 April 1943 when a flight of 14 Me 263s were intercepted by P-40s. All 14 were shot down, whilst a flight of seven Bf 109s from JG 27 tried to defend them, the escorts accounted for three of the P-40s. 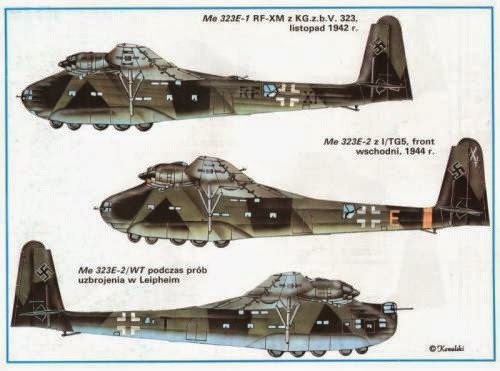 In terms of aircraft design, the Me 323 was actually very resilient, and could absorb a huge amount of enemy fire, unless loaded with barrels with fuel – the Afrika Korps’ nicknames of Leukoplastbomber (“Elastoplast bomber”) or even more derisively as the “adhesive tape bomber,” were somewhat unfair. The Me 323 was something of a “sitting duck,” being so slow and large an aircraft. However, no transport aircraft can ever be expected to survive without air superiority or at least, comprehensive local air cover, and it is believed that no Me 323s survived in service beyond summer 1944.